An easy, healthy and delicious 5-ingredient, high-protein, high-fiber, dairy-free, gluten-free vegan quinoa flatbread pizza crust recipe! This quinoa pizza crust is incredible--this I promise you! 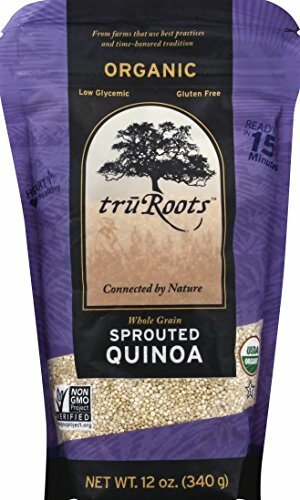 With minimal ingredients, and soaked quinoa (always good to soak your grains!) for maximum nutritional power, this little flatbread is super healthy, but certainly not lacking in taste & texture. Chewy, crispy, and with only a subtle hint of the taste of quinoa--it complements a wide variety of toppings & is sure to be a fast favorite of yours (and little ones!) in no time! Super simple and easy to make. Gluten-free, vegan, dairy-free, nut-free, soy-free, egg-free, yeast-free. Neutral in flavor and can accommodate a variety of toppings. Very healthy and requires only a few wholesome ingredients. Sturdy, slices wells, holds together and stores well. Soaking the quinoa overnight produces the best results, but you can soak the quinoa for a minimum of 3 hours in a pinch so long as you have a good quality high-speed blender or food processor. If you desire, you can omit the garlic and/or add any combinations of spices you would like. Flipping the pizza crust after 15 minutes is imperative for the best texture and thoroughly cooked results. 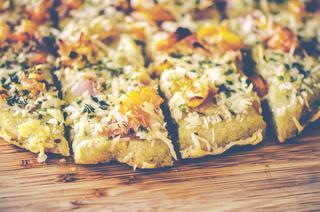 You can enjoy this gluten-free flatbread pizza crust both hot or cold. Store the cooked crust in an air-tight container in the refrigerator for up to 1 week. Re-heat in a 375 F oven until the crust and toppings are warmed throughout. You can replace standard white quinoa with red quinoa, but please note that it will require at least 8 hours of soaking time for best results. This crust tastes great with a variety of toppings! We like it served warm with vegan pesto or served cold with beet hummus. An easy and delicious 5-ingredient, high-protein, high-fiber gluten-free vegan quinoa pizza crust! The night before preparing this pizza, measure out your uncooked quinoa, place in a bowl, cover with water, cover bowl & let soak overnight.The next day the quinoa should have absorbed most of the water. Rinse & drain the soaked quinoa & set aside.Preheat the oven to 425°F. Line a cookie sheet with parchment paper, drizzle olive oil on parchment, set aside.In a food processor, combine quinoa, water, garlic, baking powder & salt. Blend until a smooth batter is formed.Pour batter onto your oiled parchment paper. Using your hands or a spatula, spread and shape your batter until about 1/2" thick (I like to form mine into an oval shape).Bake for 15 minutes, then remove from oven. Carefully flip the crust over, and if you need to, flip onto a new sheet of oiled parchment paper.Top your pizza with your choice of ingredients* & return to the oven. Bake for 10 more minutes & then turn on the broiler for 2-4 minutes, or until crust is desired golden bubbling crispiness. *Toppings as shown: drizzle of olive oil, sprinkle of dried basil & garlic powder, shredded parmesan, roasted mini sweet bell peppers, diced red onion, and a sprinkle of parsley.Enjoy!